In Broken Hearts, Fences and Other Things to Mend by Katie Finn, Gemma had her summer all planned out, but it takes sharp turn when she gets dumped and finds herself back in the Hamptons after a five-year absence. Being there puts her at risk of bumping into Hallie, her former best friend (that is, before Gemma ruined her life). But people don�t hold grudges forever. Do they? Gemma intends on making amends, but a small case of mistaken identity causes the people she knew years ago�including Hallie and her dreamy brother Josh�to believe she�s someone else. As though the summer wasn�t complicated enough already. Can Gemma keep up the charade? Or will she be found out by the very people she�s been hiding from? Sometimes when it is summer you just need a light and fun beach read.�Broken Hearts, Fences, And Other Things To Mend by Katie Finn aka Morgan Matson is a super breezy read. I mean, I whipped through this book in pretty much one day while riding in the car to an event for Tony’s family. I will be upfront and say that this was not the best summer reading book I have ever read and that so much of the drama could have been resolved with a little bit of communication, but isn’t that the way it always goes — in books and in life. Main character Gemma is shopping at Target for supplies for a service trip to Columbia when her boyfriend Teddy unceremoniously dumps her. This sends Gemma into a tailspin. It also puts a huge damper on her summer plans, as going on the service trip is no longer in the cards. So, Gemma tells her mom that she will be spending summer at home instead of in Columbia. Her mom, however, has other plans and is going to Scotland with Gemma’s stepdad who is really into salmon — in fact they are going to Scotland to check out some salmon. Thus, Gemma is forced to spend summer with her screenwriter father in the Hamptons, which is like a train ride away from where she lives in Connecticut. Gemma is dreading going to the Hamptons because when she was like eleven, she did something really bad to her best friend at the time, Hallie. When an identity mix-up happens aboard the train and everyone thinks Gemma is her best friend Sophie, Gemma sees this as her chance to make it up to Hallie and also to cozy up to Hallie’s devastatingly handsome older brother, Josh. The plot of�Broken Hearts, Fences, And Other Things�To Mend by Katie Finn is about to crackle and sizzle, as filled with drama as it is. Gemma is the sort of character who does well with this kind of book. She’s very vapid — in that she doesn’t really seem to have any real passions or anything. She kind of defines herself by guys — like with Teddy she dates him and gets so wrapped up in his causes. She is the very normal type of person. Like, she goes to the beach and to parties and has one best girl friend. She’s not super shy or quiet or introverted. She’s not incredibly extroverted either. Gemma does not come across as a reader or anything either. I mean, she has a good and big heart. She truly regrets what she did to Hallie and truly goes out of her way to fix the situation. However, I kind of thought she was bland. For me, I did not totally identify with her — but I think people who are actually normal will love Gemma. She’s sort of a non-reader’s type of main character, ya know? I can’t describe it any better than that. The romance in this book is super cute. I liked that the developments between Gemma aka Sophie and Josh were nice and slow. They really take time to get to know each other, it is a bit of a slow build. In fact, there’s a part in the book where the two watch�The Princess Bride and it is over the top adorable. I love it when books reference one of my favorite movies over. There is a minimal amount of kissing though. I am curious to see what will happen as far as romance goes in the next books in the series. I thought that�Broken Hearts, Fences, And Other Things To Mend by Katie Finn reminded me a lot of the�She’s So Dead To Us series by Kieran Scott. Like, with the drama and how I was invested solely for the plot, not because I have any sort of deep feeling for the characters. In fact, I think that this book would be perfect to recommend to people who like that series. It’s light, breezy, something you can read in a snap and filled to the brim with drama. I liked this book enough that I will probably read the next book in the series. Just don’t go in expecting it to hold a candle to�Since You’ve Been Gone. Go in expecting it to be a fun read where you don’t have to invest a whole lot to get enjoyment out of it. The fact that you could read this in a car makes it seem like a super easy read. I definitely have to check it out. Sometimes light is great. I’m just curious if the communication issues will be relatable of frustrating. I love that you said that people who are actually normal will like Gemma. 🙂 Though I guess that’s not me. But I kind of know what you mean about her being a non-reader’s character. Great review. I hadn’t picked this one up yet, but I am seriously thinking about it now. I can’t decide if I want to read this. I’ve been hearing mediocre things, and I so think Gemma would get on my nerves. But at the same time, I’m curious. I’m glad you were able to read this so quickly, especially since it wasn’t AMAZING. I am not sure if I will read this one just because there are so many good contemporaries on my TBR and this doesn’t seem to stand out to me (and I never thought I’d say this about a Morgan Matson book). I’m honestly not sure I will like Gemma if she defines herself by guys and I get very frustrated when drama could be avoided with a little bit of communication. 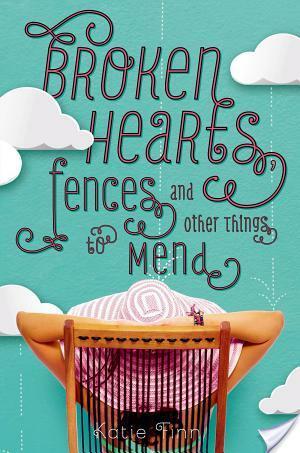 Yes, Broken Hearts, Fences and Other Things to Mend was basically just a fun summer read! I liked it, even if it was a little over the top in the drama department and also slightly unrealistic in some scenarios. But it was definitely enjoyable! And I think I actually care enough to read the next book, so that’s cool too.